I have always wanted to learn more about this bowl, but unlike my Neu Deel Cookin Ware, I have been unable to find any information about this one. 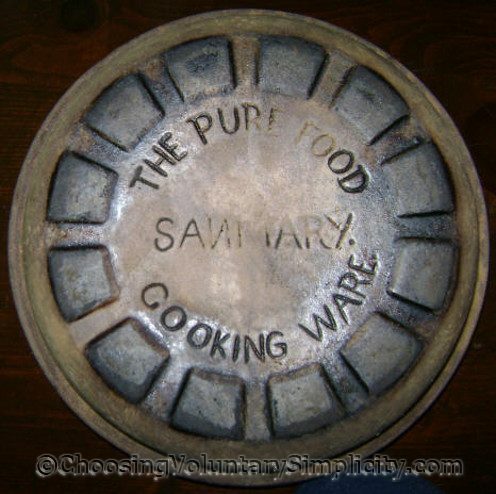 The words “The Pure Food Sanitary Cooking Ware” are stamped on the bottom of the bowl, with the “N” in “Sanitary” written backwards. The inside of the bowl is glazed and very glossy. The outside of the bowl is not glazed, and the stoneware has the typical uneven coloring caused by the impurities in the clay. The rim of the bowl has a very unevenly applied thin dark glaze, and the same glaze has been applied to the indented lettering on the bottom of the bowl. 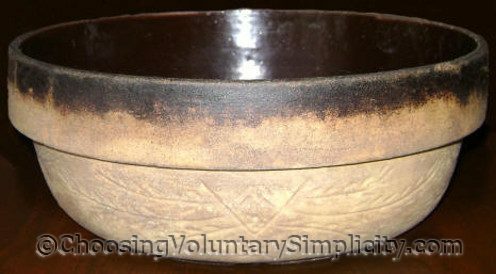 There is a simple pattern etched all around the lower portion of the outside of the bowl. This bowl came from my father’s family. I’m not sure exactly how old it is, but I know it was still being used in the early 1900’s as a favorite casserole dish by one of my relatives. Although I never knew her personally, I am lucky to know quite a bit about this woman and her husband. She gave birth to twelve children and raised eleven, plus three others from her husband’s first marriage. She was often called to nurse the sick and deliver babies. She took in boarders, including the local schoolteacher, and made butter and cheese to sell. In photographs she is never smiling, but people who knew her remember her kind nature and the way she always whistled hymns as she worked. Her husband was a farmer who raised Merino sheep. He also drove a stagecoach and delivered the mail. In all the photographs he always has children and animals nearby. He kept journals and diaries all of his life. I have several of them, and my favorite diary entry is one that he wrote on the day their twelfth baby was born… starting with a simple statement, “New baby born today, cute little shaver”… followed by a complete paragraph describing in detail the new litter of baby pigs! I’m hoping someone who has a bowl like this or knows something about the Pure Food Sanitary Cooking Ware company will see these photographs. I’d like to find out more about the manufacturer and the origins of this bowl. I have a very similar bowl to this myself. It was one that was handed down to me from my grandmother. Don’t know where it came from prior to that. Mine has the same stamp on the bottom, but the N is turned correctly. Very similar and simple pattern (yet different) around the bottom and a mottled blue glaze around the rim. If you find out anything enteresting about this company please let me know. I, too, have this lid. When my grandmother died, I got a box full of broken pieces that I tried to put together but could not- I’m sure it was the bowl. The ‘N’ in Sanitary is correct, but the ‘N’ in cooking is backwards on mine! Please let me know if you find out any info- I have run into a dead end! I do know that it was my greatgrandmothers, and she ran a boarding house. I wondered if the piece was sold for commercial use??? I have the exact same bowl. It was my grandmothers. It has a date of 1923 that I know that my grandmother had put on there as she used to date everything and I’m so glad she did. She would make her pie crust and biscuits in it. I also have several other vintage kitchen items that were my grandmothers, my moms and my mother-in-law. Thanks for the information on this. I have just arrived home from an antiquing trip and bought 2 bowls of this brand. Did you ever find out anything about the manufacuturer? I would be curious to know. One of the bowls is a pail-type bowl with a metal handle that was factory made. Any information that you have gathered would be greatly appreciated. I included my e-mail address for you as well. I would like to her from you. Julie, I have never been able to find anything about this company. I have had a number of people write to me with a message similar to yours… that they have a bowl with the name, but the “N” in “Sanitary” is not backwards like it is on the bowl I have. I would love to have some information too… if you ever find out more about this I wish you would share it with me. I just bought this bowl for $1 at an estate sale – same lettering (backwards N in Sanitary) and very old but no brown glaze. I know that I have not seen this anywhere else. I wonder where these were made? ours are a patriotic shields and Indian heads. It does not have the word SANITARY at all, just “Pure Food Cooking Ware Made in USA” along with a fantastic eagle. Wish we could all find out more about this unique maker! Deborah – I too have a bowl like yours with the wooden factory handle and the Indian head and patriotic shields. Did you find out any more about the bowl? Would love to find out how much it is worth and how old it is? Maybe someone at the Kovels website would know, or I’d check with a museum curator. Usually anything that says Made in the USA dates it to the last century. I have what looks like Deborah’s and Connie’s in that there is the patriotic shield and the word sanitary has been left out. Mine looks more like a pie plate though, unless it is the top only. Hi, I inherited a pie plate from my Great Grandmother. 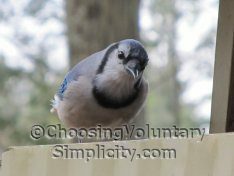 My grandmother passed it to my mother who passed it to me, because I love custard pie and they always used it to make custard pie for family dinners. 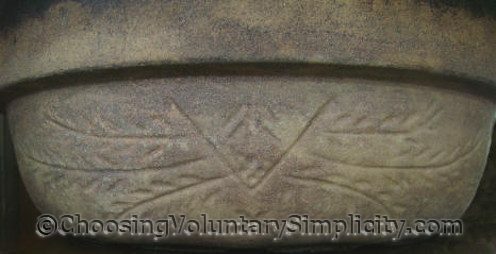 The N in Sanitary is not backwards but it does have the wheat or leaf pattern as shown in picture. It is glossy glaze on inside but not glazed on outside. I am 71 so I am sure it is well over 100 years old. It makes the greatest pies! I have a bowl just like the picture, the n is backwards. The thing about my bowl is I found it in a dumpster at my employer when I was carrying out our trash. I fell in love with it. But I don’t know much about it until I just this blog.